Cultural construction consists of family forms and traditional practices interfamily. Nowadays, even if some traditions which belong past are not applied by some part of society, these traditions re representing a cultural transition and this is why these traditions take an important place in society’s life. In arranged marriage, usually bride and groom candidates have no right to say their opinion. The women relatives of the groom candidate choose the bride candidate in the crowd places like weddings or gatherings. Women relatives of the groom candidate tell their opinion to the father of the groom candidate. If decision is made, groom candidate and his family go to the bride candidate’s house. They drink Turkish coffee, and after Turkish coffee groom candidate’s father asks family to give their daughter as a bride. Young couple can see each other only from a distance. If bride candidate’s family do not want to give their daughter, they find an excuse and say no. If the situation is the opposite the family of the bride candidate says that they should think and ask the surroundings about the family of the groom candidate to know them. Second meeting is one week later. Groom candidate side brings a little present like a towel and come to the bride candidate’s family’s house again. If both side can get along, bride candidate comes to the room and welcomes the guests. This is called a promise to wed or small engagement. Promises are given now and the girl is given also. These meetings are usually made on Friday evenings. Few months after these meetings, groom’s side goes to the bride’s family’s house for discussing the conditions of bride’s family. These conditions are usually about dowry and determine the date of the evening called ‘engagement change’. For the engagement, groom and his close relatives come to the bride’s family’s house again on determined date. They bring their engagement gifts with them. these gifts are; undergarment, clothes, engagement ring and earrings. Bride’s close relatives are gathering and waiting for their guests at home. They also prepare some gifts for the groom. They exchange their gifts, and this is called ‘’engagement change’ or ‘big engagement’. In this way, engagement part is over. Next evening, groom’s family exhibit the gifts from bride’s side on a corner in their house. Engagement entertainment is made. Some women play tambourine and sing songs during this entertainment. Some plays regional games. During these entertainments there should be only women. After few weeks, families determine the legal marriage date. Moreover they discuss what to buy. Usually groom’s family buys some gifts to the bride and her family. Legal marriage is held at least 15 days before the wedding. this legal marriage announced by the headman of the region and this announcement is hung at the center of the region. This process called ‘hang period’. Before legal marriage, bride and groom should get a health document which tells that there are no obstacles for these people to get married. On determined day, two sides meet for shopping. Groom and bride sees each other this close for the first time. Photos are taken for marriage. Shopping is done. Now two families starts to become close relatives. For wedding, both sides start their own preparation. Bride and her family cook small village bread for the henna night. This bread called ‘henna bread’. Family invite their friends and relatives to their henna night with these breads. Moreover they also send invitation cards to some people who are living far away. Preparations are more intense and dynamic at groom’ family’s house. One week before the wedding, all neighbors gather in wedding house. (Groom’s family’s house now called as wedding house) they make work division for dealing the wedding invitation cards. Invitation is made with candles or matches. Inviter either gives the invitee family a candle or matches. When invitation part is over, everyone starts to wait for the big day. Wedding starts at Friday evening and continues on Saturday, Sunday and Monday. The drum and clarinet which are played during the wedding called ‘’team’’. The more teams come for the wedding, the enjoyable wedding becomes. During the wedding at first dinner is served, afterwards entertainment starts. Regional turkish songs are played, people dances without getting tired. On henna night, bride wears red and on wedding day she wears white. Wedding City Antalya is an international wedding organizer, planner, and operator in Antalya, Turkey. We organize traditional Indian weddings, Pakistani weddings, Iranian weddings, British Weddings, European weddings. We are experienced on civil marriage ceremonies. To have a marriage ceremony and wedding dinner reception like a fairytale royal wedding, you can visit our web page or you can call us. Wedding City Antalya is the best wedding operator in Turkey. 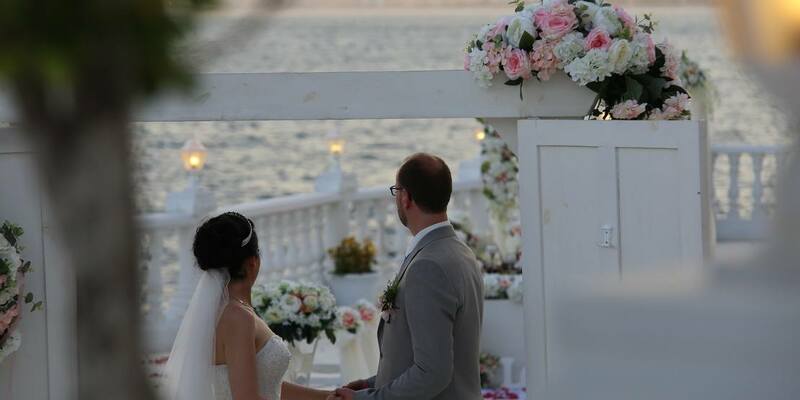 We organize beach weddings in Antalya, luxury weddings in turkey, hotel weddings in Antalya. We have all the knowledge and experience and we have the best team to prepare your wedding as you wish.